This prestige hardcover collects the first two arcs of the critically acclaimed and New York Times bestselling series; 'Family,' which introduces Forever Carlyle and her Family as they are brought to the brink of war in a future of economic collapse; and 'Lift,' where Forever uncovers a terrorist plot against her Family while another family altogether, the Barrets, take desperate measures to escape their life of poverty. PLUS! Never-before-seen work by MICHAEL LARK and graphic designer ERIC TRAUTMANN, and exclusive world-building content. 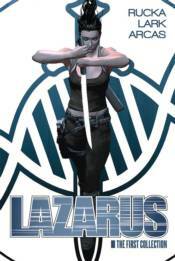 Collects LAZARUS #1-9 with four-page preview and additional content.